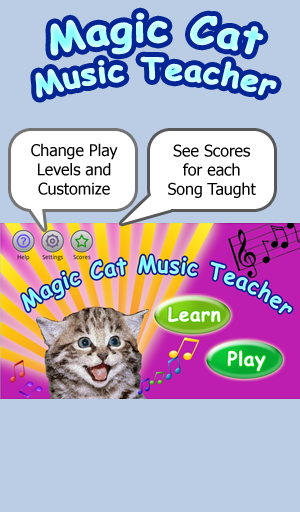 Magic Cat Music Teacher - fun for all ages! Learn music with cat meows & chimes! Incredibly easy and fun playing music on our piano chime keyboard. Need help? Follow the song's icon such as a Muffin for The Muffin Man as it jumps from chime to chime showing you the next note to play in the song. Or play music on the colorful Cat Paw keyboard. Each cat paw emits a cat�s meow in the Do-Re-Mi-Fa-So-La-Ti-Do scale. Just follow the waving cat paw as it teaches you the next note to play. Take a break from music playing & listen to crazy cat animal sounds. 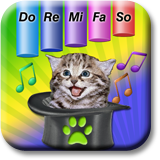 Or use Magic Cat Music Teacher in auto-play mode to listen to popular children�s songs. Magic Cat Music Teacher features 20+ popular songs like Mary Had a Little Lamb, 5 tempo speeds, and 3 animated music learning games with scorecards. Compete to get the highest score or just play for fun. Tested on cats, dogs & kids. Cats give it a 5-yawn rating. Dogs think they hear real cats. Kids find the Magic Cat games delightfully challenging! Find the purring cat-in-the-hat. Watch his mouth open & close as you press on him. From the makers of the popular Drum Set Kid, discover all the fun animations that amuse & encourage you to learn how to play music with the Magic Cat Music Teacher. Enjoy dancing musical animations as Magic Cat Music Teacher plays each song. Plenty of songs to select from, with a simple tap on the Song button. Want to hear a song? Just tap the Play button anytime. Now, try playing the song yourself or tap the Follow toggle button for help in learning. In Follow-Me learning mode, the song�s icon appears over the next note to play. It's the purr-fect music teacher for toddlers, kids, and adults or as a lullaby music player for babies. Due to Magic's Cat's 1080P high-definition images and high quality non-compressed sounds, we recommend having system RAM memory of 512 MB or more. Most current generation Smartphones and Tablets have 512+ MB RAM including all devices, Kindle devices, etc.